Out-of-hours, junior doctors and medical students often find themselves covering specialties and subspecialties out-of-hours that they have little or no experience in. 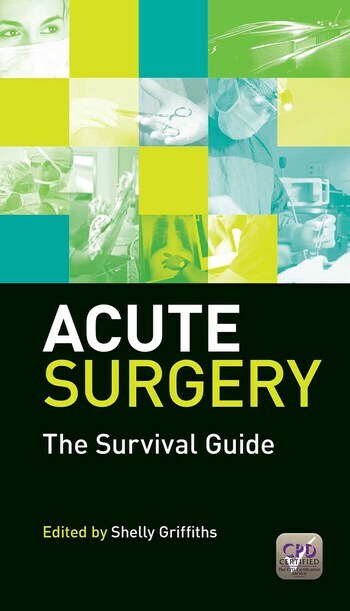 Acute Surgery: The Survival Guide is the only completely up-to-date pocketbook on the market providing a clear plan for the management of common acute presentations in a concise, easy to manage format. It promotes confidence in dealing with the daunting range of acute presentations and provides a fail-safe approach to patient management plans in general surgery, vascular surgery, urology, EN T surgery and orthopaedics. It also contains vital advice on management of commonly seen ward issues and the approach to trauma patients. This handy guide offers clear, practical advice for junior doctors, medical students, foundation doctors and core surgical trainees. It is also highly recommended for nontraining doctors, in-house and senior house officers. Preface. Chapter 1: General surgery. The acute abdomen. Right iliac fossa Pain. Herniae. Gallstone disease. Pancreatitis. Diverticulitis. Obstruction. Acute mesenteric ischaemia. Rectal bleeding. Rectal prolapse. Abscesses. Wound infections. Chapter 2: Vascular surgery. The acutely ischaemic limb. Abdominal aortic aneurysms. Acute aortic dissection. Leg ulcers. Chapter 3: Urology. Acute urinary retention. Haematuria. Scrotal pain. Renal colic. Phimosis. Paraphimosis. Priapism. Urological trauma. Catheters. Chapter 4: ENT. Epistaxis. Foreign bodies and food boluses. Acute stridor. Tonsillitis. Nasal trauma. Pinna trauma. Otitis externa. Otitis media. Orbital cellulitis. Acute facial nerve palsy. Chapter 5: Orthopaedics. Assessment of radiographs. Open fractures. Acute compartment syndrome. Spines. Pelvic fractures. Hip fractures. Femoral shaft fractures. Tibial plateau fractures. Ankle fractures. Arm fractures and dislocations. Forearm fractures and dislocations. Pathological fractures. Septic arthritis. Tendon injuries. Chapter 6: Trauma. Chapter 7: The wards.